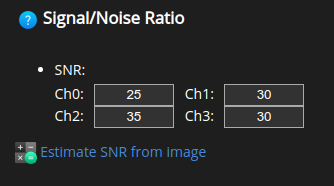 In the Huygens Software the Signal-to-Noise ratio (SNR) is treated as a regularization parameter, i.e., a means to control the sharpness of the deconvolution result. Yet, one should be aware of the effect of extreme SNR values on image deconvolution: too high SNR values can produce restoration artifacts; too low SNR values can lead to smooth structures. After a little practice it is possible to assess the SNR range for deconvolution visually. Notice that the SNR should increase with the quality of the raw data. Confocal: between 20 and 40. STED: between 10 and 20. Widefield: between 40 and 60. HRM offers an estimator to further help you find good SNR values for the deconvolution runs. Click on to use the SNR estimator. In a new page you will be asked to select an SNR estimation method. The beta method gets good estimations on images without a baseline. When working with images that contain a baseline the classic method can be used instead. The output of the SNR estimator shows (per channel) a thumbnail next to 4 different noise simulations of the same region. In bold letters the SNR of the simulation that most resembles the original image. By pressing the estimated SNR values are copied into the restoration parameter template.